In RVing and camping, you may come upon terms that may be clear to your everyday RVer or camper, but might as well be Greek to rookie RVers or outsiders. Imagine this scenario: You pull up to a campsite and begin your RV hookups, but you see two different taps for water. One says potable while the other states non-potable. What do these two terms mean, and what you should plug into? Let’s get some terms down pat so you can know exactly what potable means. Did you know that in the previous scenario, the two taps were labeled drinking water and wastewater? Would that make more sense? Well, that is what is meant by potable. 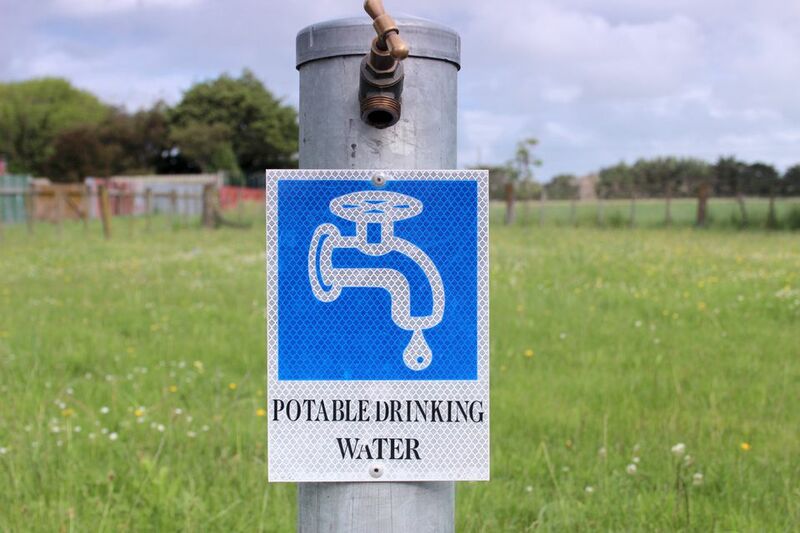 Potable means that something is safe to drink. You could put your mouth right under a tap labeled potable and drink from it. Potable doesn’t always mean that the water has been through a seven-stage carbon filtration system, but it has been through some type of cleansing and, for all intents and purposes, is safe for humans to consume. Where Is Drinking Water Stored? An RV is a housing unit on wheels, and any livable living space likely needs suitable drinking water. In the case of the RV, this water is flushed from and kept in the fresh water tank. This tank may be referred to as a white-water tank, fresh water tank, or potable water tank. In the end, all these different terms mean the same thing: the water stored in this tank is fit for human consumption to be used for cooking, cleaning, or drinking. Whenever you are connecting your freshwater tank to a water supply, you need to make sure that the water you are tapping into is potable water. Failure to do so could cause a host of ailments, and in the worst case, lead to death. Taps that are not meant for human consumption are almost always labeled as wastewater or non-potable water. Keep your freshwater tank away from them. Pro Tip: If you’re not sure about the water quality at an RV park or campground, ask! Most let you know ahead of time which water sources are potable. If you’re boondocking, you’ll need to bring along your own potable water source. In the case of filling up, RVers generally only have to worry about getting their fresh water tanks full. Your gray water tank will be filled up with fresh water that goes down the drain from sources that won’t lead to large contamination such as your sink or a shower. While not as harmful as black water, gray water is still not potable and not meant for human consumption. Use your gray water to wash the RV, do some laundry, or clean dishes. Just remember that it is unfit to drink. All that's left is the black water tank. No part of the black water tank should ever be considered potable or even close to potable. In fact, if water even touches the black water tank, it should be considered wastewater, even if you are flushing out your black water tanks after sterilization. Pro Tip: Always remember to dump your black tanks when they’re full or before you hit the road. The last thing you want is a black tank spill that can cause issues for your RV sewer system and clean water. What If It's Not Marked? Water won’t always come from a marked tap, especially in off-the-grid RV adventures. There are ready-made tests to help determine if water is safe for drinking. Make sure to pick some up before going on a trip where you know you’ll have to harvest water from a questionable source, no matter what kind of filtration system your RV has. You won’t be able to enjoy your trip if you’re sick from contaminated water.